We had TWO people who asked in the same week for help finding this lamb, so I’ll give you both stories. We helped Melissa find one, but Kelly is still looking and so is Rachel. 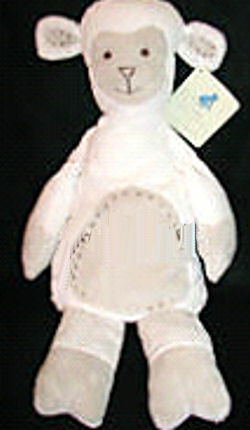 I am in search of a stuffed chenille lamb that was purchased from Pottery Barn Kids for my son Owen in 2007. It’s the Pottery Barn Kids Chamois Lambie that I’ve been looking for. We’d like the small version (12 in. long), as we have a big version, and he knows the difference. I received it as a baby shower gift, and Owen has loved him ever since he was born (he just turned a year old in Sept). Our lamb, named Lambchop ( or, as Owen calls him, DOG), is already starting to show wear and tear, and I can’t imagine what would happen if he would fall apart or be lost. Please help me find some backups! My 16 month old is attached to her baby lamb, and we desperately need to find another one, since this one is constantly being washed. I didn’t know she would love it so much, or I would have purchased another when I bought it at the outlet store. We also need the 12 inch version. I have this lamb new. It was $8 orginally sold in PBK. It is little longer then 12 inch. Contact me if you want it. Hi Katty – we are interested in this lamb too. do you still have it? we would like to buy it from you. our daughter is distraught without hers. I know how to contact Katty, but I don’t have any contact information on YOU, Diane! Hi there – can you reach me now? I just didn’t want my email addressed published on a public web page…I now have entered some of the info requested by the web page. Please CONTACT US. I don’t suggest that anyone show their email address publicly. I have already sold and sent the lamb to Melissa. Sorry I don’t have another one. Thanks so much for the lamb Katty. Even though Owen knows the difference, I now feel better that we have a back up just in case ours falls apart or gets lost. I really appreciate it! ebay #330613173423 10 inch 1 bid day and a half to go.